Morocco, which re-joined last year the African Union, its institutional family, has gained praise for its migration policy and management at the 30th African Summit convened in Addis Ababa. Several African Heads of state attending the AU summit paid tribute to the leadership of King Mohammed VI, to his commitment and to his dedication to the African cause. The summiteers, who had named the Sovereign Leader of the African Union on the Question of Migration during the AU 28th summit in Kigali, commended the “African Agenda on Migration” submitted by the Moroccan Sovereign to the AU summit Monday (jan.29). This agenda was drawn up using an inclusive, participatory approach. It includes the ideas, proposals and thoughts shared by official institutions, civil society organizations and researchers from Africa. In his message to the summiteers that was read out by head of Government, Saad Eddine El Othmani, the Moroccan King said the African Agenda on Migration proposes an approach based on national policies, sub-regional coordination, a continental vision and international partnership. This Agenda should seek to make migration a lever for co-development, a pillar of South-South Cooperation and an instrument of solidarity, he said calling for setting up an African Migration Observatory and naming an AU Special Envoy for Migration. The African Migration Observatory’s mission would consist in developing observation and exchange of information between African countries in order to promote controlled management of migration flows, while the AU Special Envoy for Migration would be tasked with coordinating AU policies in this area. Morocco hosted two regional and international conferences to help enrich and elaborate the African agenda on migration ahead of the AU Summit. Morocco hosted these conferences due to its noteworthy experience in migration management, its support and respect of migrants’ rights, especially those from sub-Saharan African countries. Morocco plays an increasingly vital role in mapping out international migration guidelines. The North African Kingdom co-chairs with Germany the Global Forum on Migration and Development (GFMD) aimed at contributing to the United Nations’ Global Compact on Migration. The Compact is intended to constitute a strong signal of the international community for an enhanced global migration policy. 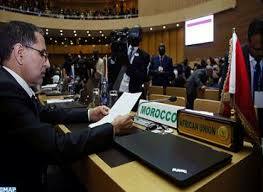 Morocco will also host this year the intergovernmental conference on international migration. The conference, due Dec.10-11, will discuss global compact for safe, orderly and regular migration. The Community of Sahel-Saharan States (CEN-SAD) hailed the Royal Message to the AU Summit as “an excellent analysis” of the issue of migration and welcomed the proposal to create an African Observatory for Migration and the post of an AU Special Envoy. Secretary General of CEN-SAD, Ibrahim Sani Abani, in a statement to the media, also paid tribute to the Moroccan Monarch’s commitment to Africa and hailed the large-scale projects he launches in the continent, during his African tours. “The AU and Africa in general need Morocco, a very important country for the construction of the pan-African organization,” the CEN-SAD Secretary General said. Malawian Minister of Foreign Affairs Emmanuel Fabiano also hailed Morocco’s relevant migration policy, which stands out for its inclusiveness, and which serves, he said, as a model for other African countries. If other countries adopt the same approach, the issue of migration will no longer be a problem in Africa, he said. Besides being commended for its migration policy and for its endeavors to enhance South-South cooperation and Africa’s integration, Morocco was also granted on Monday in Addis Ababa an African Union’s award for its performance in implementing the Malabo Declaration on Accelerated Agricultural Growth and Transformation for Shared prosperity and improved Livelihoods. The award, handed over to Head of Government, Saad Eddine El Othmani, by AU Chairperson and Rwandan President, Paul Kagame, is a recognition of the Kingdom’s efforts in developing agriculture, particularly through Morocco’s Green Plan. Posted by Jaber Ali on Jan 30 2018. Filed under Headlines, World News. You can follow any responses to this entry through the RSS 2.0. Both comments and pings are currently closed.